Peter Riegel, an American mechanical engineer and competitive runner, developed a simple computer implementable formula in the 1980's. A research engineer by profession, he first became curious of the relationship between distance and world record times in various sports. For example, when he plotted running times vs running distances on a log-log plot, he found a straight line fit for all distances that spanned from the mile to the marathon. In fact, he found that the straight line fit existed for any endurance sport he examined with the caveat that the range of validity was from any effort greater than 3.5 minutes upto 3:50:00. Anything outside this range and the straight line fit did not hold true. I'm not sure how he quantified the error threshold at which to abandon straight line representation. I imagine this threshold would have had to be different for short distance racing compared to long distance racing, since a deviation of even a handful of seconds during a 200m event can mean the difference between first place and last place. The same is not necessarily true for long events. Short distance events : Short, high intensity transient phenomena were not represented well by simple equations. This must mean anerorobic performance cannot be fit to linear equation. Long distance events : Increased fatigue on body, lack of world-class competition data in very long distance events and introduction of multi-day events with rest were also not represented well by simple linear equation. The fatigue factor is used in a simple exponential equation to predict an unknown distance performance from a known distance performance. This results in a simple race time predictor which can yield surprisingly close predictions if used for the same class of runner, gender and possibly age. This is the math behind the predictor formula used in a number of running websites. The originator is therefore Riegel, the engineer. Fig 1: The Riegel time predictor formula. fatigue factor = Amount a runner's speed (or velocity) decreases as race distance increases. Calulated as the slope of ln speed vs ln distance plot, negated and added to 1. Riegel calculated fatigue factors for several classes of runners according to the best available data of the late 70's. I've marked them in the red circle below. Figure 2 : Table showing Peter Riegel's original fatigue factors based on data from the 1970's. I decided to plot ln-ln slopes for world class runners of both genders using latest available data of 2017. I started with women's road races. The following ln-ln plot of time to distance results in a slope of -0.0397 (R2 = 0.7283). Fig 3 : ln-ln graph of women's world class road racing bests. When corrected into the fatigue factor form, it results in a number 1.0397. This is appreciably different to Riegel's estimation of 1.08 back in the day, a percentage decrease of 3.9%. It sends a little shock through your system. 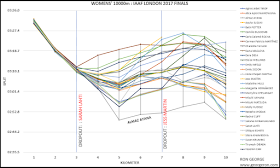 The decrease in the fatigue factor shows that the world records are not just tumbling in women's racing, they are being destroyed. The other obvious implication is that slope appears to be straightening out, meaning that women are seemingly able to maintain faster speeds for longer distances. The woman mainly responsible for this phenomena on the road this year is the young Kenyan superstar Joyciline Jepkosgei, who smashed 3 WR's on her way to the women's half marathon world record. Whether she had a tailwind at her back in Prague, I do not know but her run that day yields a Daniel's VDOT of 74.4. At the other end of the spectrum is the marathon WR of Paula Radcliffe, who is in her 14th straight year of the unchallenged record while she enjoys retirement. The 2003 WR yields a Daniel's VDOT of 74.7, stunning when compared to Jepkosgei's WR in the half this year. Though not totally uncontroversial, it goes onto show what an absolute phenomenon she was! Now the fun part. Using the fatigue factor of 1.0397, the Riegel prediction for Joyciline Jepkosgei if she had a go at the marathon is 2:13:21. Her coach, whoever they are, should be really interested in this bit of news, although I think they already know and if they knew they would also consider the R2 = 0.7283. For reference, the graph used the following data. You are welcome to correct me if I got any of the numbers wrong. Fig 4 : Table showing the data behind the updated Riegel model for world class women's road racing. 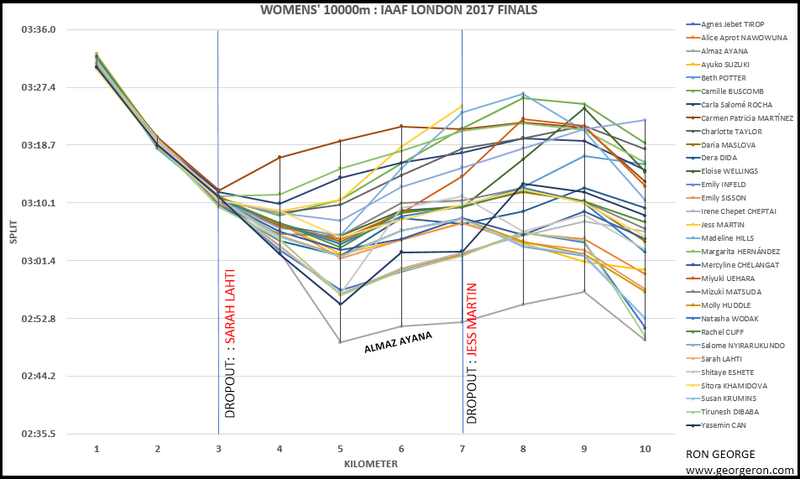 In similar fashion, I plotted the ln-ln plot of speed vs distance incorporating the latest IAAF world records from 2017. The fatigue factor comes out at 1.1228 (R2 = 0.8381). Compared to Riegel's estimate of 1.08 for women from the 1970's, this constitutes a 13.7% increase. I would tend to doubt if Riegel actually examined women's track records separately so I'm not sure if this comparison is valid. Fig 5 : ln-ln graph of women's world class track racing. Fig 6 : Table showing the data behind the updated Riegel model for world class women's track racing. The biggest eye popper in the WR list is Olympic gold medalist Almaz Ayana's 10K performance at the IAAF Worlds in London. I followed Ayana's kilometer splits that night, live. It was incredible. With a Daniel's VDOT of 74.9, she left a world class field consisting even of Tirunesh Dibaba in the dust and managed to lap the lagging runners atleast once around the track. I applied the Riegel fatigue factor for young female world class road racing to a 40 year old long distance runner X to see how off the predictions are when using her 10K time to predict half marathon time. Both the races were held in the U.A.E and just a month apart. Runner X is a retired world class European runner and currently an entrepreneur. Even in retirement, she performs within 80% or more of absolute world class runners. Outcome : Interestingly, the prediction was under-estimated by 2 minutes 58 seconds. Runner X finished in 16th place at the half marathon. The 17th place runner finished in 1:17:57. Would you consider this an error we can live with in the absense of any other data? You decide. The following table compares X's actual performance with old and new Riegel models and several other running predictors easily available on the internet. As (luck) would have it, my updated Riegel model specifically for women's road racing performs better than any of the others. Again, please keep in mind that the case study was to predict half marathon time using 10K time. Fig 8 : Comparison of updated Riegel prediction for women's road racing against 10 other models widely available on the internet. The error in prediction in also calculated and shown. In this writeup, I updated the fatigue factor or what people term the Riegel exponent to include road racing and track racing data from 2017 for women. The new fatigue factor for world class road racing = 1.0397 and that for world class track racing = 1.1228. The results, atleast on the road racing side are startling. The reduced fatigue factors suggest that women's road racing is alive and kicking, with women seemingly able to race faster for longer distances. Track racing records have also been broken this year but other than the women's 10K, records in other distances within the validity range of Riegel equation have not seen a major shakeup. Due to the complexity of the topic, any discussion of physiological factors or training interventions responsible for the faster times are excluded in this post. I used the updated Riegel model for women's road racing to predict the half marathon performance of a 30-39 age bracket world class road runner living in the U.A.E. The model appears to give the best predicton when compared to 10 other models. Since world records are being broken year after year, it seems justified that running prediction calculators for world class runners should update their fatigue factors as new data comes in. A. The understanding is that specific data for a runner takes precedence over estimations done using data for world class athletes, the latter which can detrimentally over-estimate race time if mis-applied. B. Specific data involving similarities in race course and weather conditions takes precedence over distributed data containing a variety of different races courses and weather. In general, it is better to avoid exceptionally tough courses and/or conditions involving generous amounts of assistors, such as a tailwind or rabbits, from the dataset. See part 2 for Riegel fatigue factors for men's racing. Riegel, Peter S. “Athletic Records and Human Endurance: A Time-vs.-Distance Equation Describing World-Record Performances May Be Used to Compare the Relative Endurance Capabilities of Various Groups of People.” American Scientist, vol. 69, no. 3, 1981, pp. 285–290. Link to paper.